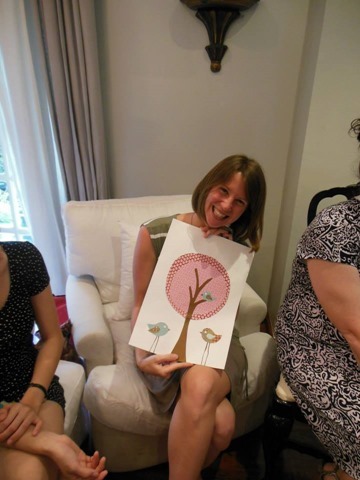 2 weeks ago, several of our lovely friends from school (Beth, Keeley, and Kim) organized a baby shower for me and my friend Therese. 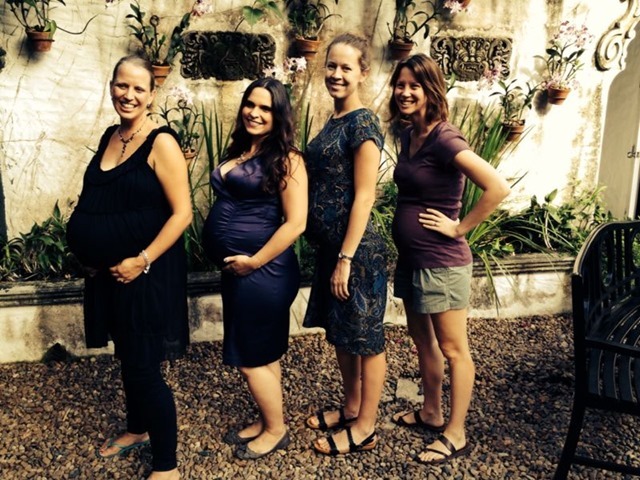 Therese is a high school English teacher at the school, and the students’ prototype for what a normal pregnant woman should look like. 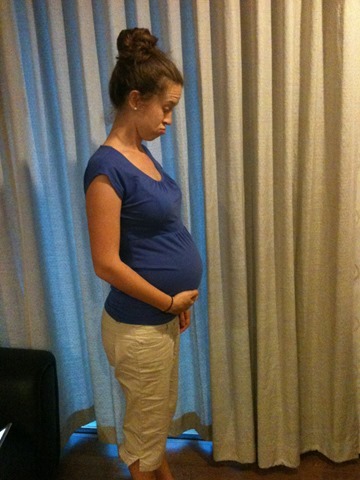 I blame her for all the confused looks the students give me when they witness my massiveness (the fact that I am due in November and she is due in February doesn’t seem to register – these children have grown up without health class). Therese is very happy to be of service. 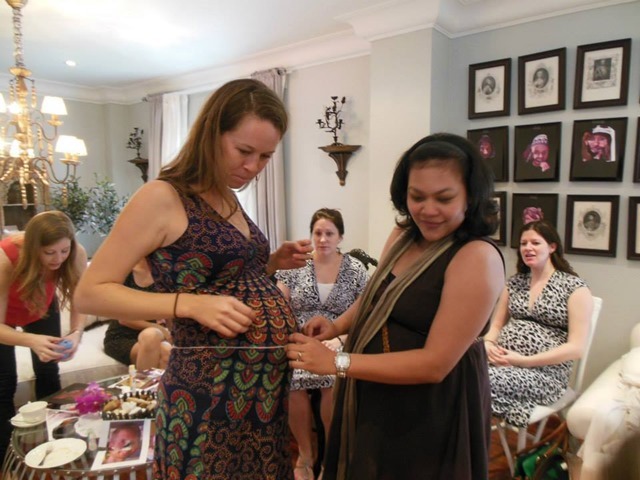 I wasn’t totally sure what to expect before I got to the shower – most of the baby showers I’ve attended in Canada have been laid-back, men-welcome affairs – and I was totally blown away with what the hostesses had prepared. For starters, the venue was awesome. Agaligo is a Victorian-style mansion with a variety of different party appropriate spaces. I was so excited to discover that the room we were in was decorated in perfect, delicate taste, EXCEPT for the dead fox in a glass case on the wall. Oh Thailand. You make me so happy. 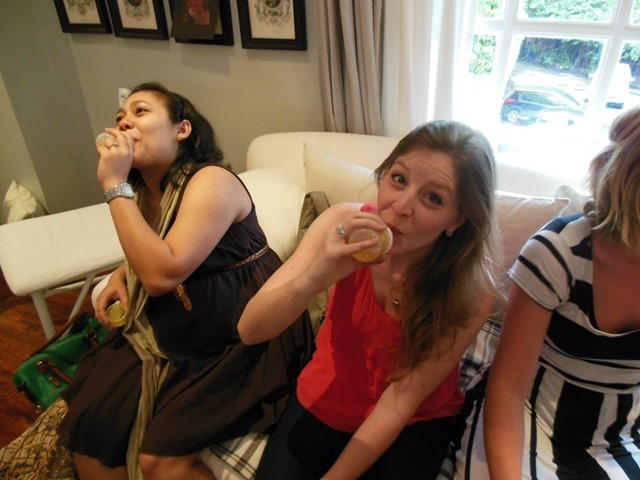 Once I managed to heave myself back into an upright position, it was time for the party games to start. I had never even conceived (haha) of most of the games the hostesses had planned, and their attention to detail was mind-boggling. 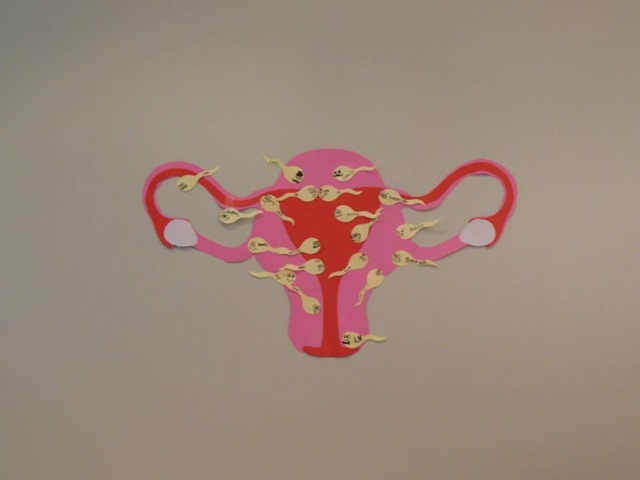 As someone who struggles with details on a daily basis (ie: remembering to wear shoes), it would never occur to me to create an anatomically correct paper uterus and a bunch of sperm with faces for a game of “pin the sperm on the uterus.” Well, maybe the idea would occur to me, but the execution would be sadly lacking, and I definitely would not have remembered to offer appropriate prizes. And voila! 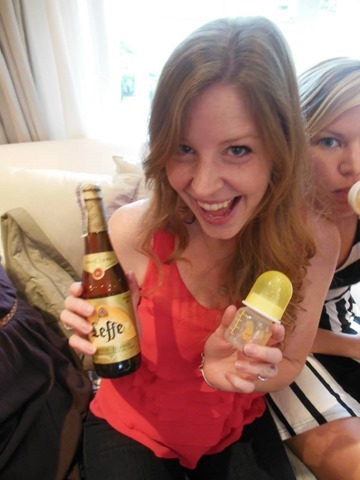 Leah and I had a baby together! 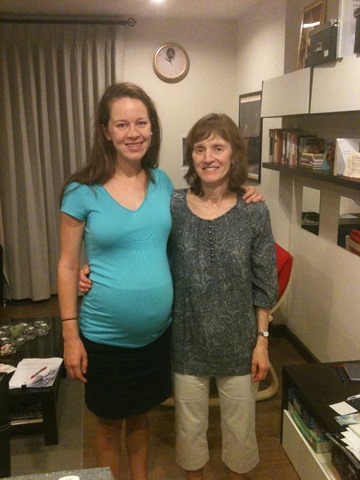 She won a vase of fresh flowers, and I won… a baby. 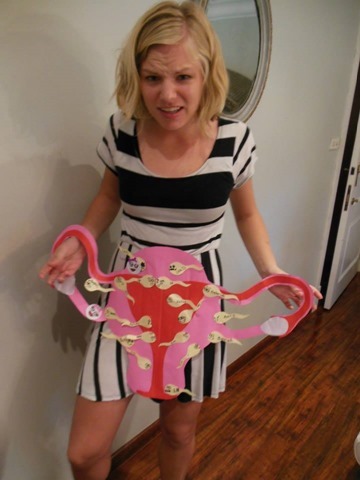 The female anatomy is still very confusing to Ellen. 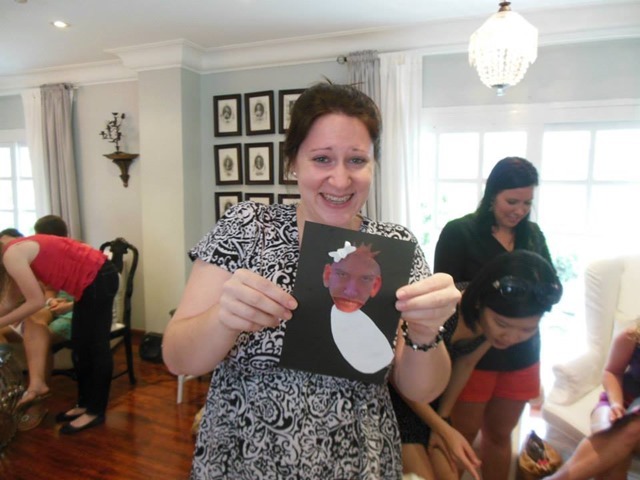 But the games didn’t stop there: attendees also got to create collages of what my and Therese’s babies will look like, using headshots of us and our respective husbands. Lisa came up with a real gem. Oh well. At least she’s in head down position. And then it was time to guess how big Therese and I measured around the middle. I tried not to be too offended when some guesses were off by a foot or more (and not in my favour). 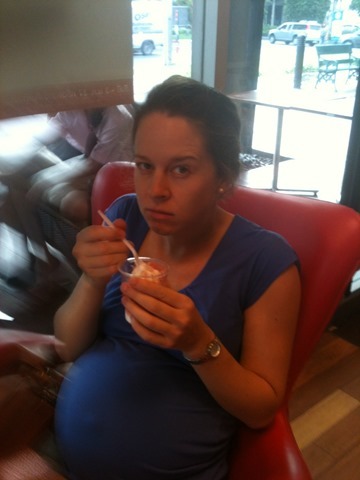 Rina is also very pregnant, though, so she took pity on me. Rina and Sarah demonstrate their best latching faces. And Sarah’s competitive spirit and perfect latch win the prize. 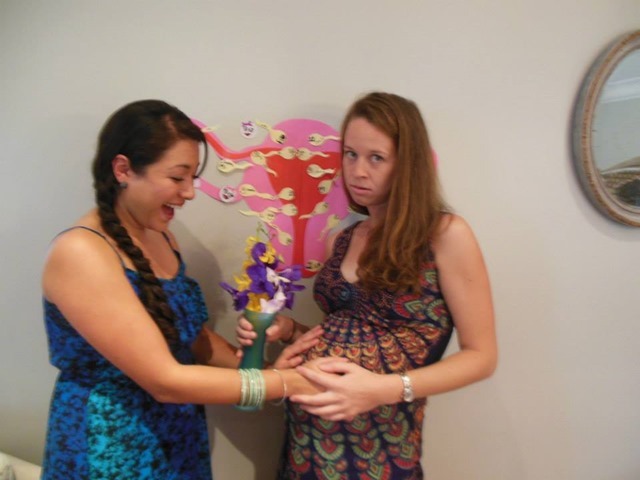 Ellen is still finding the female anatomy quite confusing. A bunch of us lived in an apartment building last year called “Big Tree,” and until we delivered the goods, both Therese and I fielded many, many requests for a “Big Tree Baby.” So the hostesses thought it would be appropriate to create a piece of nursery art for each of us that included a “big tree.” No offence to the building, but the artwork is much, much cuter than that sewage-scented apartment ever was. 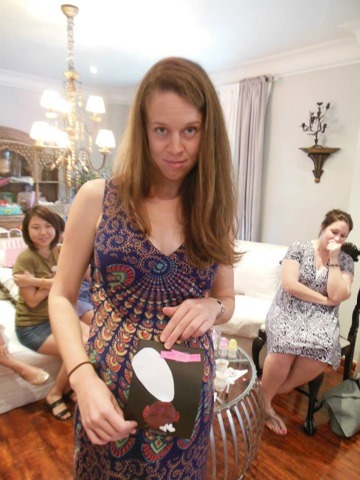 First, she’s the perfect pregnant prototype, and now, she has a cute piece of baby art. Therese is one happy, happy camper. 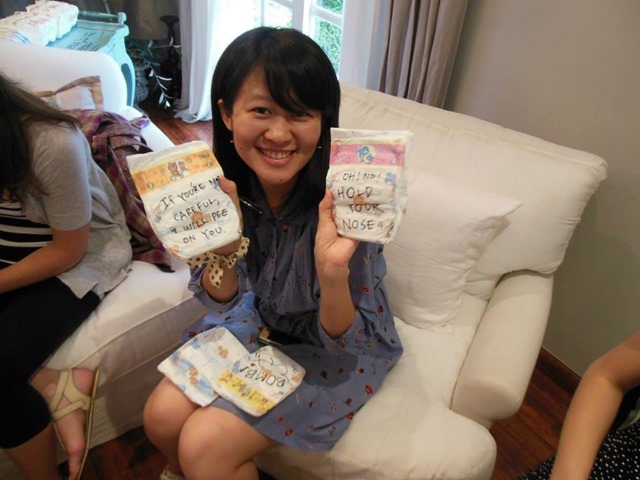 Our friends also wrote messages on a bunch of diapers for those wonderful, highly-anticipated, middle-of-the-night diaper-changing sessions. Hopefully, having a little light reading material in the wee hours will wake me up enough that I don’t drop Bannock. Adorable Vera and dirty diapers are such a visual oxymoron. Our friends gave us a bunch of really thoughtful gifts. I’m not going to showcase them all here, but I had to share this li’l number: crocodiles’n’ babies might be my new favourite combination. I did not know such epicness existed, but Katherine managed to find it. 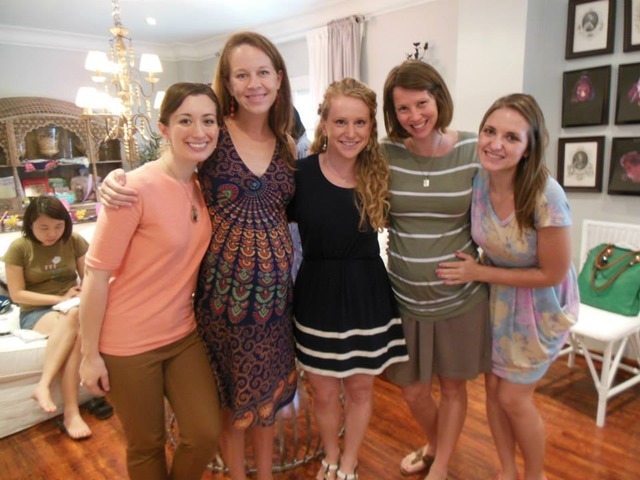 A huge thank-you to Beth, Kim, and Keeley for planning such a great celebration. 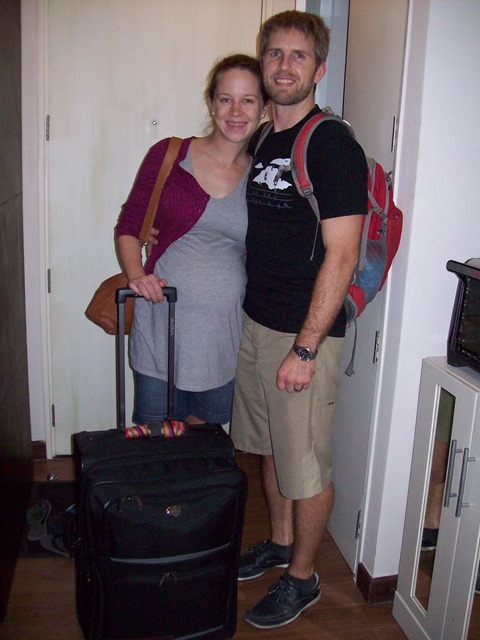 Having a baby in a different country can feel a bit crazy at times, and feeling so much support from our Bangkok community was huge for both me and Therese. The love in our hearts for you three is even bigger than our bellies. This past weekend was basically split into three equal parts: the first involved an abundance of testosterone and hosers, and the second involved an abundance of estrogen/progesterone/prolactin/insertyourfavouritefemalehormonehere and babies. During the third part, we were basically comatose, which is always a good time but difficult to describe, so we’ll just leave that part out. This blog may have somehow given you the impression that T-bone likes doing Stoopid Schtuff on a regular basis. You would not be wrong (for further evidence, see this post or this post or this post or this post). In fact, I strongly suspect that this is why he married me, but I digress. 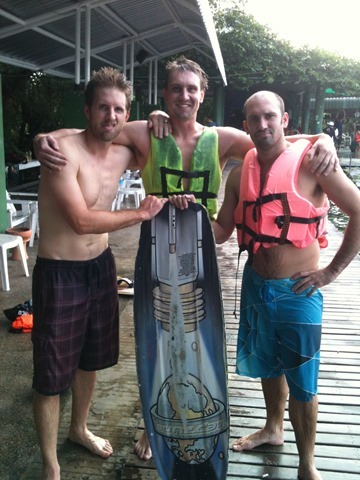 T-bone’s favourite Stoopid place to go in the Bangkok area is Taco Lake. When I first heard of it, I started dreaming of Mexican food, but sadly, Taco Lake doesn’t appear to have anything to do with its tortilla wrapped namesake. 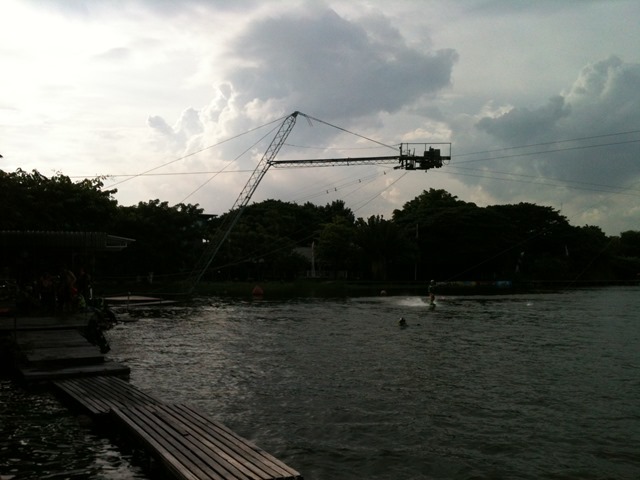 Rather, it is all about wakeboarding. T-bone is also All. About. 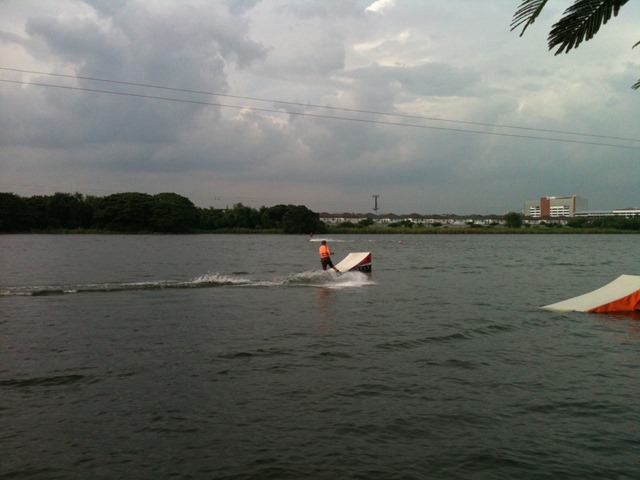 Wakeboarding. 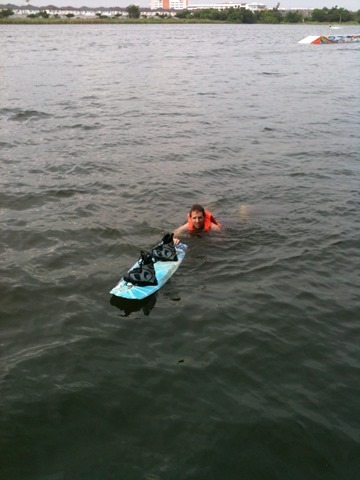 The lake has a bizarre/ingenious rope system that runs a bit like a t-bar at a ski hill. 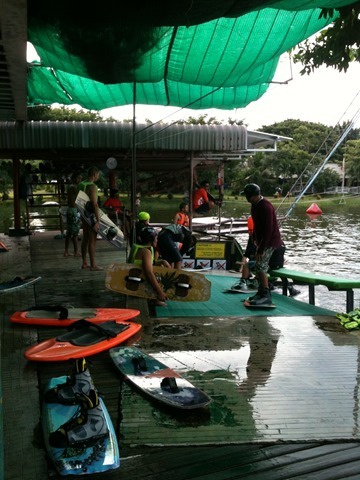 Wakeboarders wait on the edge of the dock until their rope is pulled, and if they can manage to hang on, they can ride around the lake until they either fall off or give up. The pulley system that miraculously keeps on pulling. 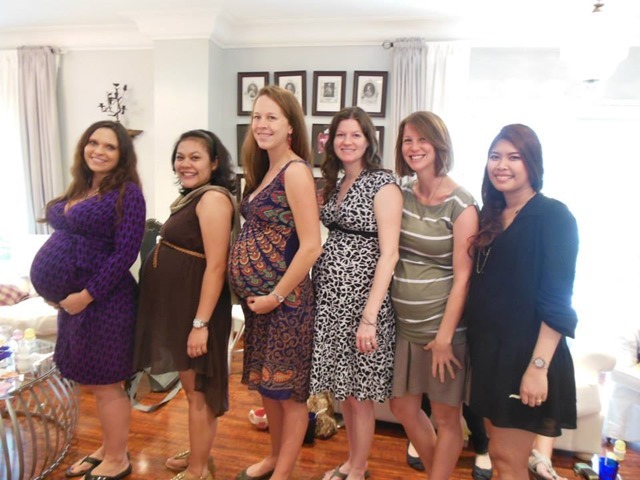 Lining up for their turn (and not at all weirded out that a pregnant farang is taking their picture). Every time Todd comes home from Taco Lake, he has a limp in his step and a gleam in his eye, and I can tell that he is already dreaming of his next trip. 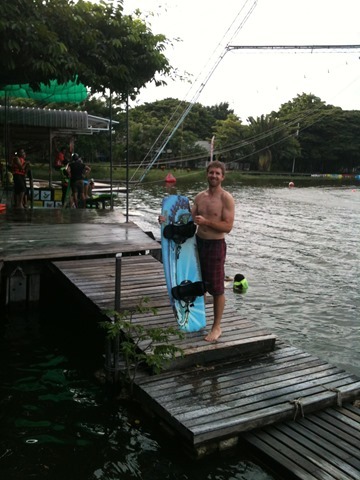 We have agreed that after Bannock is born, he will be responsible for all care-giving/breastfeeding duties (only fair since I am incubating her), so he decided he’d better fit in one more wakeboarding session while the gettin’ is good. Stoopid Schtuff is the most fun when done with Stoopid People friends, and it didn’t take much for Todd to convince his entire math department to join him. The hoser math department. Motto: We dig numbers’n’neon. After Taco Lake, Saturday was a bit of a shock to the system. 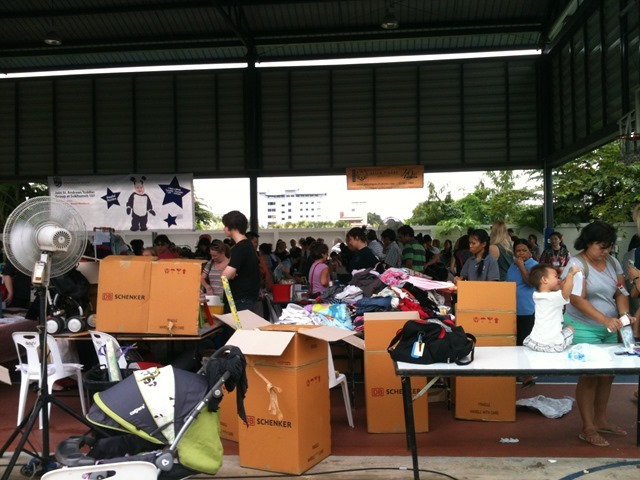 In the morning, BAMBI, Bangkok’s biggest mothers and babies group, put on a massive garage sale of baby/kid stuff. 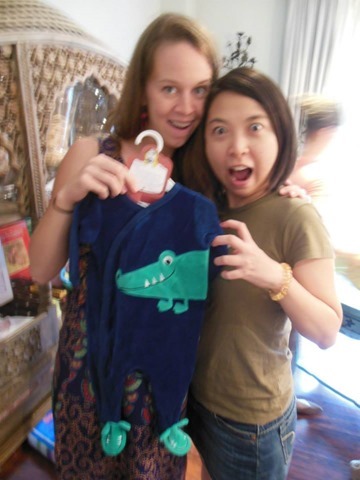 Partly because baby gear is so expensive in Bangkok (crazy import taxes), and partly because my deeply entrenched value system tells me to “never buy anything new if you can buy it used and never buy anything used if you can find it in a back alley/dumpster,” I knew this was a sale I needed to hit up. Todd had to supervise Saturday detention, so other than the two dozen friends I bumped into and the ten million members of the general public at the sale, I was utterly alone. This is only a small corner of the sale: I couldn’t fit the whole scene in the frame. 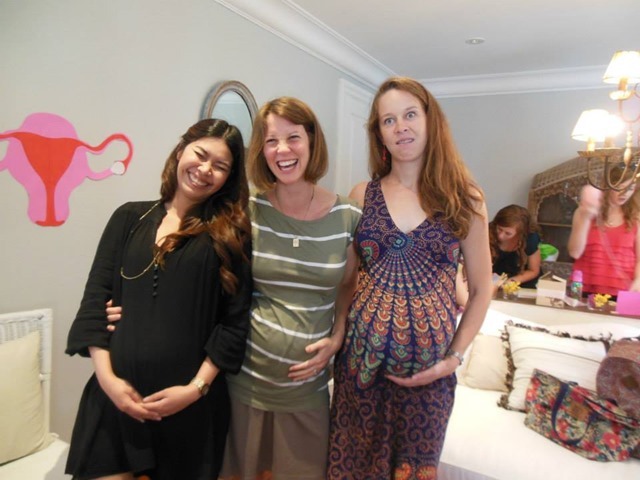 Clearly, this was the place to be for anyone in Bangkok who has ever spawned, is preparing to spawn, or thinks that they may spawn at any point in the near or distant future. Honestly, it was all a bit terrifying. I had a few items that I was searching for, and I ended up finding those, plus a few things that I forgot I needed. Most of my purchases have names that are neither English nor any other identifiable language: ie: “Boppy” “Bumbo,” etc. This is why parents end up speaking gibberish to their babies. 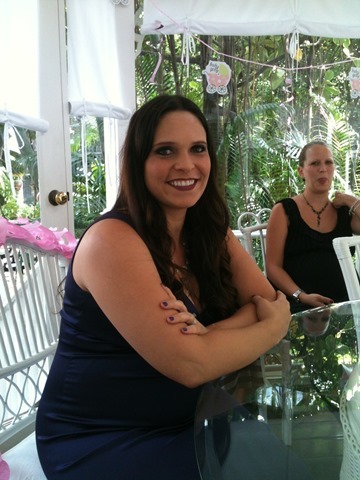 After 1.5 hours of the feeding frenzy, I called it a day, because I needed to make myself semi-presentable for the second baby-centred item on the agenda: my friend Nicole’s baby shower. Nicole used to be a teacher at our school, and is the mother of a two-year old. She is one of the first people I went to for advice after I found out I was expecting. 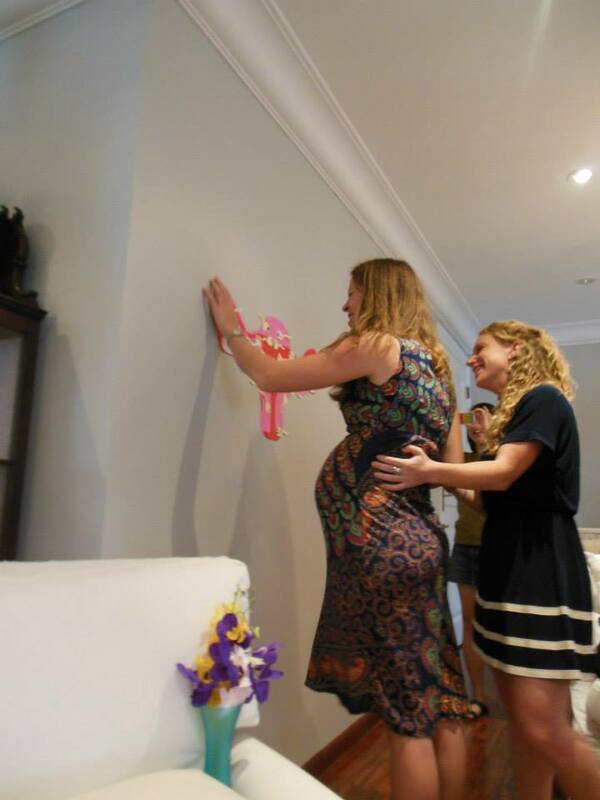 Turns out that she was/is too, and depending on when they decide to make their grand entrance, our daughters will be born just a few weeks apart. That’s where the similarities end, though, because she is a stylish belly dancer who wears clothes and makeup that actually coordinate. I dig mini men, but I have to say that baby girls are way more fun to shop for. 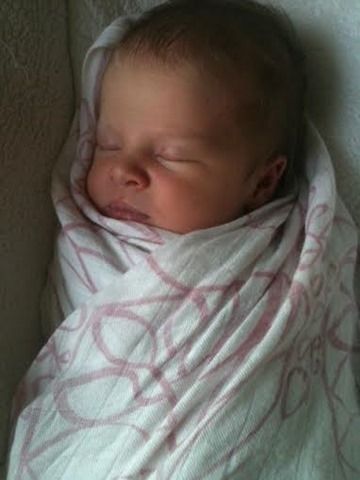 Nicole’s baby received the usual explosion of pink frills, with a bit of purple thrown in to mix things up. I didn’t even attempt to be original with my gift: my cute reflex has officially overridden my gag reflex these days. It was an adorable afternoon. We spent this past weekend in Kanchanaburi, a charming town a few hours north west of Bangkok. 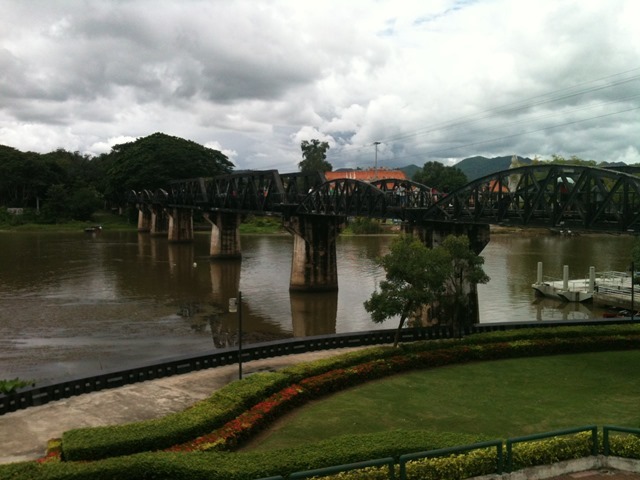 Ever since I found out that it contained The Bridge on the River Kwai of WWII infamy, I’ve been itchin’ to visit. Mere itching is rarely enough to get me off of the couch, though – lately, I need a more compelling kick in the pants reason to travel. Fortunately, one arrived in the form of T-bone’s ongoing hobby: dragging himself out of bed at unprintable hours to run long distances in heinous humidity. 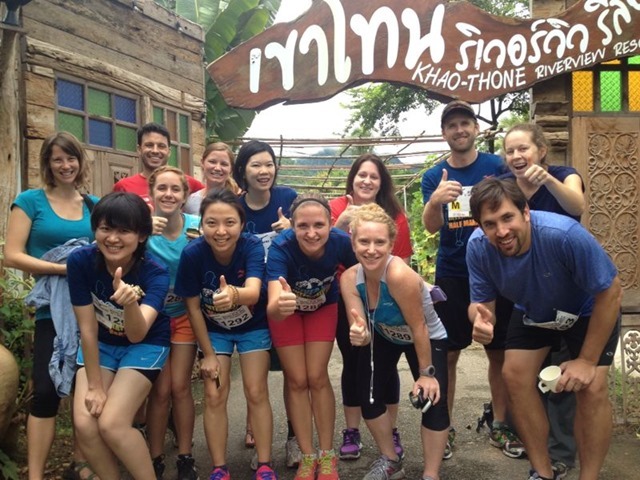 T-bone has run a few races since we moved to Bangkok, but the Mizuno River Kwai race was his first half marathon. His friend Eli persuaded him that this was a necessary milestone before they both become fathers in the next few months. 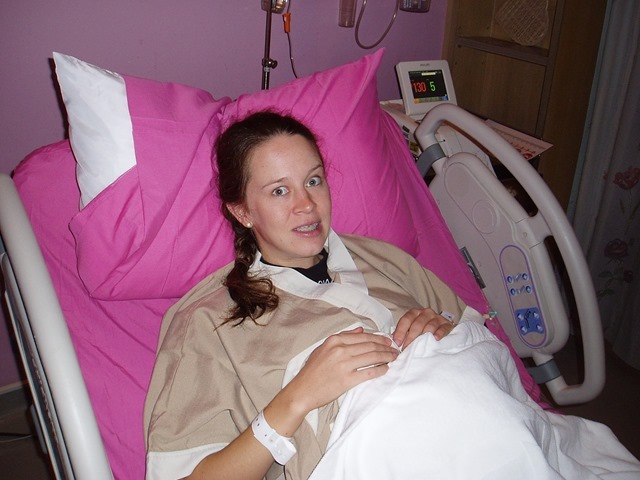 Childbirth can be a real body wrecker, so the boys needed to take advantage of their still-agile joints and lithe bodies. 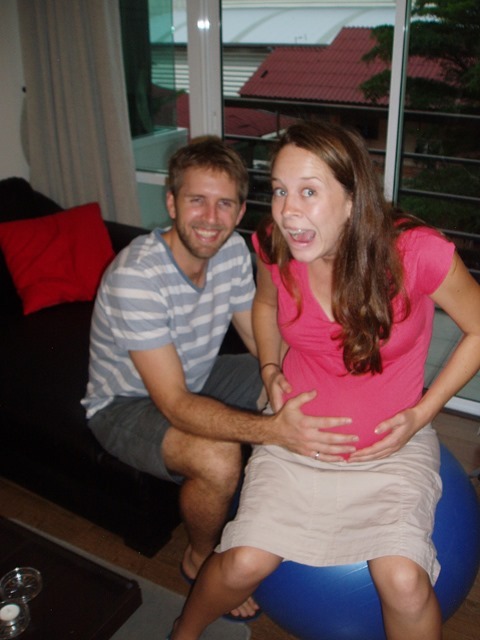 Todd preparing his face for labour, while Eli is still blissfully naive. 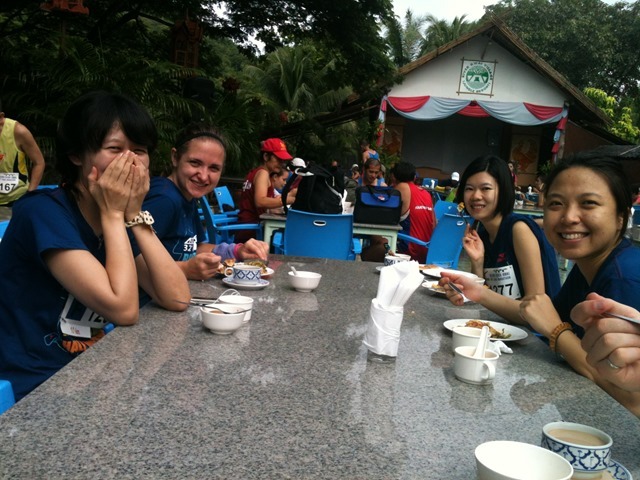 Before race morning on Sunday, we spent some time exploring the town and surrounding jungle. 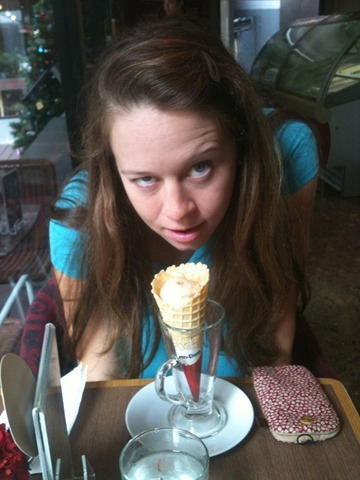 First, though, it was necessary to spend several hours drinking bad Nescafe (is Nescafe ever good?) and contemplating the river. Unfortunately, our contemplations left us with minimal time to actually check out the famous bridge and nearby museums. So we used my favourite tourism technique: wander aimlessly around, snap a few photos, and absorb the aura of the place. Actually, I recommend “aura absorbing” for any time in your life when you are pressed for time/have zero intellectual energy/are fighting the third deadly sin otherwise known as sloth. It is highly effective. 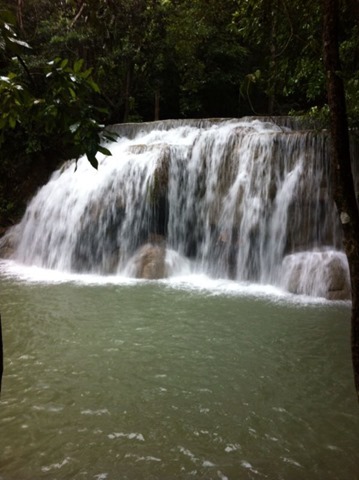 We were in a rush because we wanted to visit Erawan Falls (a famous series of waterfalls) located in a nearby national park. 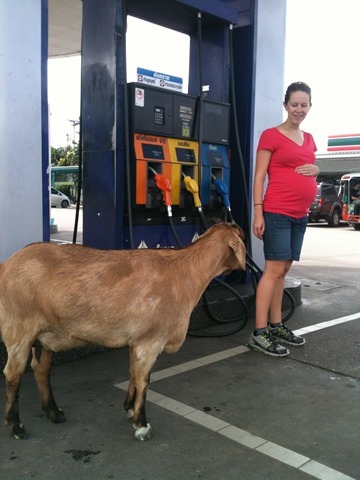 On our way to the park, however, we were waylaid by a friendly, pregnant goat. 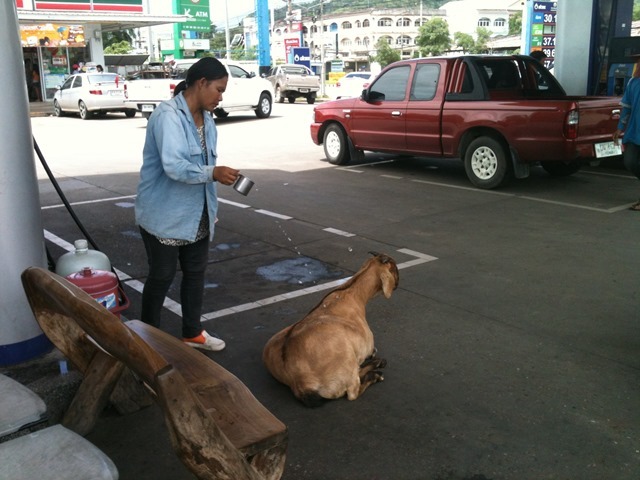 She was relaxing by a gas pump when our song taew pulled up, and despite the best efforts of an employee to shoo her away (by throwing ice cubes at her) she showed no interest in leaving. I feel a deep sense of kinship with pregnant creatures large and small, so it was necessary to engage in an extended photoshoot with her. When we got to the second set of falls, I finally convinced myself to jump in. I spent my entire time in the water frantically twitching to try to keep the fish from latching on. 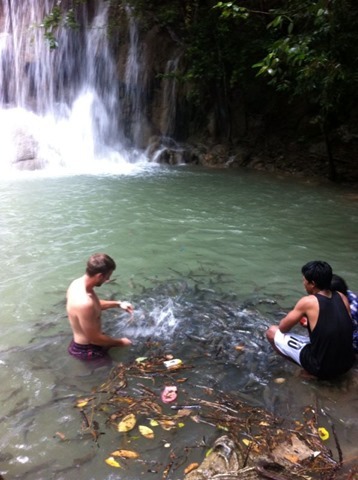 By the time we finished at the waterfalls, it was time to head to our Guesthouse on the River Kwai in preparation for a horrifically early race-day morning. Adorable newlyweds Josh and Jaime enjoy the view. Hard to tell from the photo, but the guesthouse is actually a Houseboat on the River Kwai. After a rough start (transportation that didn’t show up), all the runners made it to the starting line on time, and had a great race. 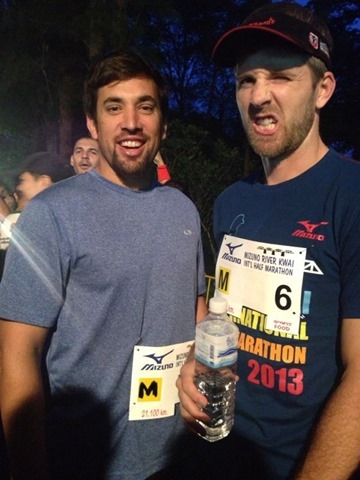 Since my speed is more of a waddle these days, I like to live vicariously through Todd, and I was pretty impressed with “our” finishing time of 1:54. One flesh, right? 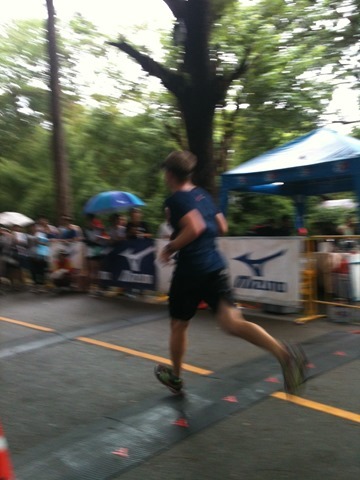 So fast that neither I nor my crappy camera could capture the moment. 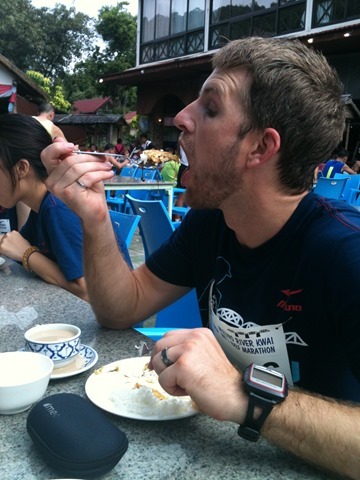 The race breakfast was a dubious mix of mediocre Thai food, more Nescafe, and deep fried stuff. Ahhh. Great combo for those sensitive, post-race guts. Todd bravely forcing himself to eat for two. 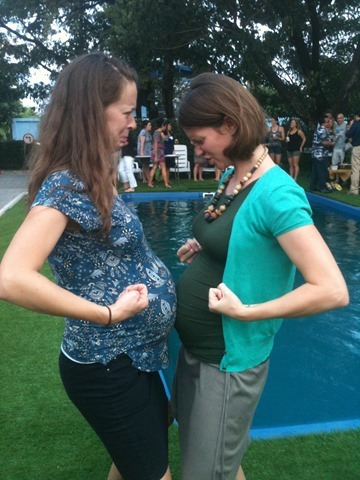 All in all, it was a great race day weekend, and now Todd and Eli can allow their bodies to succumb to the ravages of pregnancy. With Eli’s posture being the first casualty.